See the Foothills Homes Sales January 2016 video update for Single Family Residence (SFR). Just click the link below to view the latest months Single Family Residences activity. In addition to the Oro Valley home sales report, our Tucson Housing Report covers real estate active for all of Tucson AZ. Our Tucson Foothills Homes sales report video summarizes the January 2016 sales results for this sought after residential area north of Tucson AZ. The Foothills area is home to the Catalina Foothills High School in District 16. CFHS is consistently ranked in the top Tucson area school districts. Play Kim’s January 2016 Foothills Homes Sales January 2016 Video Update – NOW! The Catalina Foothills area is bounded by River Road to the south. Oracle Road to the west. Sabino Canyon Road to the east. The Santa Catalina Mountains and Coronado National Forest are to the north. The history of the Catalina Foothills began in the early 1920s. Prior to that the Foothills area were primarily federal trust land and open range. Early development began just north of River Road. Ten housing subdivisions were planned. These early subdivisions were to have large lots and low density residential living. Good fortune shined down on this development in the name of Josias Joesler. Joesler was a Swiss architect who had immigrated to America. Development began in the 1930’s. Joesler designed many of the homes in the Catalina Foothills. A “Joesler” home is a sought after and treasured residence in the Foothills. The Catalina Foothills School District was established about this same time. The first Catalina Foothills School District building was near East River Road and North Campbell Avenue. That building remains and is CFSD’s administration facility. The Catalina Foothills High School is just south of Skyline Drive and west of Swan Road. It is rated among the top schools in the Tucson metro area. The Catalina Foothills continued to expand and prosper. Residents founded the Skyline Country Club in 1963. Skyline Country Club is one of the Foothills up scale private clubs. The Catalina Foothills has a number of nationally recognized resorts. La Paloma Resort and the Ventana Canyon Resort were established in the 1980’s. Around 2005, La Encantada was opened. It is located at the northwest corner of Skyline Road and Campbell Avenue. La Encantada brings up scale retail shopping to the malls in the Tucson metro area. Other recognized resorts in the Catalina Foothills include the Hacienda del Sol, Westin La Paloma, Loews Ventana Canyon and the world famous Canyon Ranch Resort. Today, the Catalina Foothills local area has a population of over 50,000. The majority of the communities have a low-density and suburban character. The Catalina Foothills has some of Tucson’s most impressive homes. Tucson City lights and mountain views abound. The Catalina Foothills has some of the most high-priced homes and land. 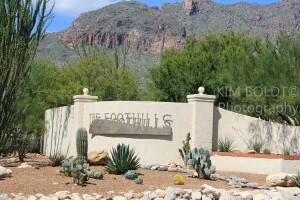 Tucson MLS statistics show the “Foothills” has the highest median property value in Tucson. Looking for a home in the Catalina Foothills OR a condo for a winter get away? We can help!